Knowing the basics about diamonds can help couples choose the perfect engagement ring. Cut: The precision the stone is cut with, including angles and proportions. Cut is not the same as shape. 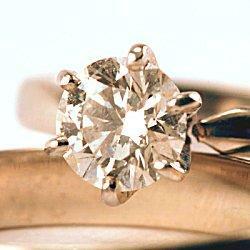 Clarity: The pureness of the stone based on flaws or lack thereof. Color: The stone's hue, whether it has a mild tint or a rich, distinctive fancy color. Carat: The weight of the stone and its overall size. Larger stones are typically more valuable. How each of these characteristics interacts greatly influences the value and beauty of a diamond. For example, a small carat weight stone may appear larger and more beautiful with a precise cut, and great clarity can help improve the color of a stone. There is far more to a diamond than just the four Cs. Knowing how diamonds are formed can give couples a greater appreciation of their rarity and value, and the anatomy of the gem can help them learn the intricacy of a jeweler's art and understand the specialized language. But before couples rush out to find a ring, they should be aware of the cultural influence diamonds have. Conflict diamonds, for example, are quite undesirable in the jewelry industry, while artificial stones are becoming more popular. Different diamonds, such as The Hope Diamond and a Hearts on Fire Diamond have a mystique all their own based on the cultural perception of the stones. Know the basic characteristics about diamonds as well as the specific qualities of colored diamonds and other specialized stones can help couples make the best choice when buying an engagement ring. Whether they're interested in a loose diamond or wholesale stone to create a custom ring or they just want to know what factors influence the diamond industry, being an educated consumer is the key to making a wise purchase.